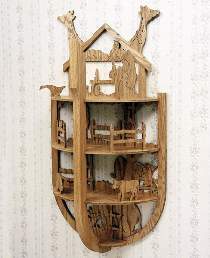 A spectacular scroll saw project in the shape of Noah's Ark. Scenic background portrays fourteen different animals. Includes four shelves to hold knick knacks. Built from 1/4" plywood and 3/4" stock. Shelf measures 13"W x 25"H. Plans drawn FULL SIZE. Order two sheets of Oak plywood.